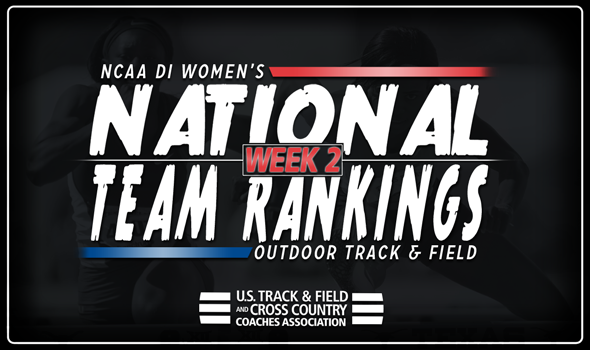 NEW ORLEANS – A relatively quiet week on the track & field circuit left the NCAA Division I Women’s Outdoor National Team Rankings with little changes over the course of the week, as half of the top-10 remained in their spots from a week ago, announced the U.S. Track & Field and Cross Country Coaches Association (USTFCCCA) on Monday. Georgia was the team that benefitted the most from action this past weekend, as the Bulldogs jumped from ninth to fourth after a strong outing at the Spec Towns Invitational. A total of six top-10 NCAA Division I Descending Order List marks were set by the Bulldogs at the meet. Keturah Orji posted the second-best long jump mark in the country this year at 6.71m (22-0¼), while Tara Davis was not far behind at 6.63m (21-9) after also posting a 13.04 in the 100 hurdles. Louisa Grauvogel scored 5,887 in the heptathlon for the third-best mark in NCAA Division I this season, and Tatiana Gusin (high jump), Kate Hall (long jump) and Lynna Irby (200) all found themselves high up on the Descending Order List after the weekend. Southern California also made some positive movement in the rankings, moving up one spot to third. The Women of Troy were impressive at the 39th Sun Angel Classic, where Anna Cockrell and Dior Hall ran 12.89 and 13.02 in the 100 hurdles, respectively in addition to Deanna Hill and Kendall Ellis posting respective times of 22.78 and 22.91 in the 200. All four marks sit in the top-10 in NCAA Division I this season. However, other than the two aforementioned programs, the remaining eight teams in the top-10 either held their ground from a week ago, or slipped in the rankings. Arkansas and Oregon sat first and second, respectively, once again. While the Razorbacks were off, the Ducks got in some work at the Pepsi Team Invitational. The Ducks’ 4×100 relay team posted a time of 43.92, making them the eighth-best program on the NCAA Division I Descending Order List. LSU rounded out the top-five, staying put in fifth. The Tigers held the LSU Battle on the Bayou this past weekend where it saw its 4×100 relay squad run a 42.50, tops in NCAA Division I this season. Additionally, Kortnei Johnson ran the third-best 200 time of the season with a finish of 22.52. Two Big 12 squads in Texas (eighth) and Kansas State (10th) remained in the spots from a week ago. However, the rest of the top-10 did not fare as well. Texas A&M slipped out of the top-five to sixth, while Kentucky was right behind the Aggies after falling one spot to seventh. Florida also fell two spots to ninth. The NCAA Division I Outdoor Track & Field Championships will be held in Eugene, Oregon, at Historic Hayward Field on June 6-9.